Bedbugs are tiny, dark brown insects, which come out at night to feast on human blood. Before you panic and start taking measures to get rid of these blood-sucking parasites, you should make sure that you actually have a bedbug problem. Determining if you have a bedbug problem is very easy. All you have to do is look for bite marks in a pattern on your body, check your shoulders, arms, and legs; these are the vulnerable points while you sleep. If you see itchy red welts in a zigzag pattern on your arm, then you are dealing with a serious case of bedbugs. Ok, the next step is to figure out the extent of the infestation. You need to find out if these tiny bugs are just in your bedroom, or if they have spread in your whole house. If you find bedbugs only in your bedroom, then you are dealing with the initial stages of infestation. However, if it is the other way around, then you need to do something and fast. To get rid of bed bugs, follow the steps given below. You will have to apply these steps in every room, to get rid of them permanently. The first stage in eliminating the imminent threat posed by bedbugs is to remove every item on your bed. Put your sheets, cushion covers, blankets, pillowcases, mattress covers, and bed liners in the washing machine. Pour hot water over them; wash and dry them off in the dryer. Then set them out to dry further. 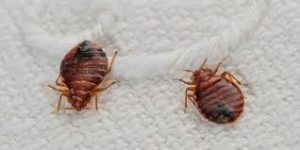 Do not place them back in your bedroom until it is free of bedbugs. Follow the same process with all the fabric present in your home. 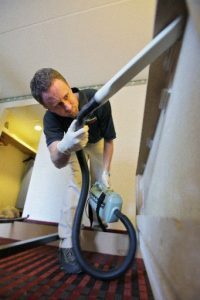 Vacuum the rest of the fabric, which is not washable thoroughly, to remove any bedbugs, which may be hiding under the covers. Put the fabric in a plastic bag, seal it off and set aside for 3 days. This will kill off any bedbug, which escaped the vacuum. Time to enter stage 2. Take a closer look at your cupboards, drawers, or any other small space. Inspect it thoroughly for any signs of bedbug inhabitation. You might come across bedbugs or their eggs. If you do find them, then wash all of your clothes as well. Follow the same procedure as explained previously. Check your bed; that is one of the most likely places where these can reside. It will be incredibly difficult to get rid of all if they enter in your mattress. In most cases, you might have to discard it and buy a new one. However, if you decide to keep your mattress, buy a plastic cover and cover it entirely. Let the mattress remain covered for a whole year before opening it. You need to make sure that nothing gets out of the mattress. Or else, it’s back to square one. crannies; these are the likeliest places where you may find them. Once you have vacuumed everything, tightly seal the bag, and throw it away immediately. To be on the safe side, it’s best to take preventive measures. If there are any cracks or holes from where the bedbugs may enter, close them up. Use caulk or any other material to seal off the entrance. This way, no bedbug will enter your home again. After completing all of the aforementioned steps, it’s time to clean your house. Use a good quality cleaner for this purpose. Make sure to clean every piece of furniture you own. In short, clean everything in your house. After your house has been cleaned, you can return everything to its respective place and redecorate without fear of finding any of these pesky critters anywhere. You can try Vacuuming them. Also, you can use DE at various corners of the house. Be careful though if you have children or pets around.